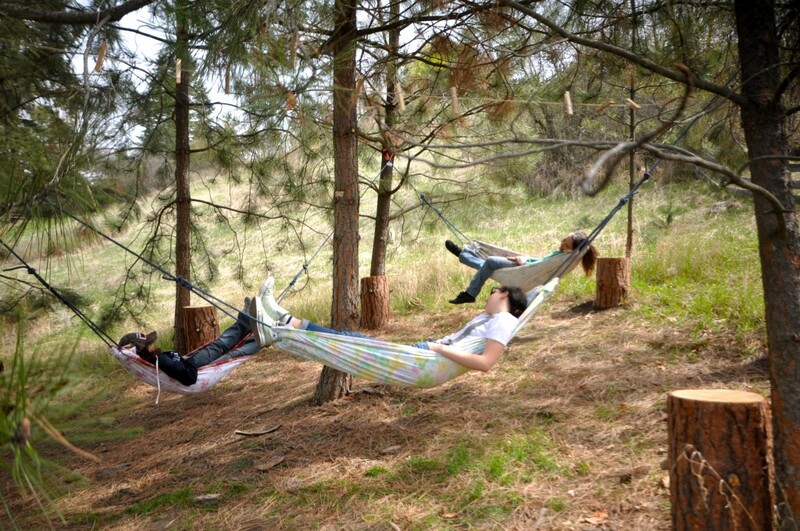 Three Sheets to the Wind is a hammock installation that invites participants to share what it means to be connected in an oscillating ecosystem. The interactive installation Three Sheets to the Wind was the product of a graduate level studio course in interdisciplinary practice designed to give graduate students an opportunity to work collaboratively to create hybrid work drawing on the group’s collective strengths. The course emphasized collaboration and the creative translation and integration of disparate inspirational sources. While students may have developed their research methodologies and approaches to praxis as it applies to their own work, this course requires that their learning be applied to a collaborative and interdisciplinary process rooted in body-based research and inspired by the body-based pedagogy of Jacques Lecoq. “The aesthetic of Three Sheets to the Wind creates a moment of simplicity for the participants. The “jungle gym”-ness of the installation brings the audience to a time of childhood and play that is often remembered nostalgically as “simpler.” That frame is broken when a participant realizes the level of cooperation required to actually enjoy the hammock. The exercise shifts from one of simple pleasures to a trilateral negotiation. “Everyone sit in unison.” “One person wants to leave; let’s all get up.” “Are we all about the same weight? Will the hammocks be balanced?” The complexities of adult life come bubbling to the surface” (Kadish, 3). “The importance of threes is in the way in which the third element causes attention to be divided. In a binary system, participants are able to focus on the singular other. This may allow for an in-depth contemplation of one’s own position relative to the outside, but it does so with a narrow point of view. There is but a single line of sight to the person or thing opposite one’s own position. The third element causes the participant to constantly shift focus. The third element enables an empathetic stance by continually reminding the participant that there are multiple, equally important perspectives” (Kadish, 6). The Eco Art Incubator had commissioned Three Sheets to the Wind for one national conference and one community event at a local Bird Sanctuary. It was the simple yet complex design that engaged the public sensorially, playfully, and intellectually. The process and resulting project exemplified the richness of translation possible through authentic (and body-based) conversation with each other and with nature. The work generated from this course was supported by the SSHRC funded Eco Art Incubator project which helped to finance its presentation at the 2012 Association for Literature, Environment, and Culture in Canad) Conference. Two of the three students were financed and invited to present their work and under the auspices of the Eco-Art Incubator initiative, at the 2012 Module Dance Symposium: Ethics in Aesthetics- For an Ecology of the Arts of Both Environment and Body, held in Tilberg, Netherlands. Prudhomme, Julia. Three Sheets to the Wind: Experiment #2. IGS Course 520D Project Reflection, University of British Columbia- Okanagan: 2012. Kadish, David. Three Sheets to the Wind: Complexity, Empathy and Knowledge. IGS Course 520D Project Reflection, University of British Columbia- Okanagan: 2012).